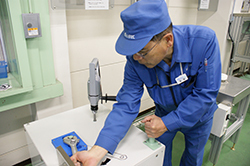 Efforts for Safety and Health | Safety and Health | CSR | MURATEC,MURATA MACHINERY, LTD. In With the goal of raising levels of awareness regarding safety, we have established a Safety Discipline Dojo as a facility where safety education is conducted by having participants experience simulated latent dangers in the workplace at each factory. 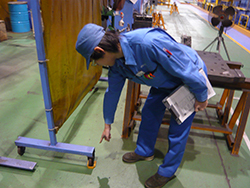 In the manufacturing sections of our L&A Division and Clean FA Division,we started conducting EHS Daily Audit in workplaces inJune 2013. We have continued to conduct these audits every day since then. Project teams were formed for the execution of the audits. The series of auditing processes, including auditing item selection, scheduling proposals and workplace feedback of auditing results and their immediate reform, were incorporated into workflows. A key of these activities is an arrangement to have regular reports about the audit results given weekly to the responsible managers.This way, the activities are authorized and the orientation of the activities is aligned for the achievement of goals. Since starting this,results have been tending to improve. Our Head Office and Ise factory implemented the “5S Daily Audit”. The audit aims to improve office safety and hygiene,and help reduce costs. Each auditor makes the rounds in his or her area, examines each point listed on a check sheet, and scores the item accordingly. Points for checking include potential hazards around the office,for example, ‘passageway objects that might cause someone to trip’ or ‘insufficient huddle space under an employee’s desk in the event of a disaster’. There are also checkpoints for workplace hygiene, such as ‘dust accumulated on surfaces’. In addition, some checks are aimed at reducing costs, such as ‘surplus stationery not needed around the office’. By carrying out the daily audit and sending the score results to managers in the audit area every day, we can promptly take measures to rectify any problems identified. We also communicate an overview and audit scores to senior managers every week. Based on their feedback, we are making organizational efforts to promote and expand this initiative.